Dr Arthur Evershed MRCP (1835 - 1919) didn't seriously take up etching until he retired. As a young man art was what he wanted to do more than anything and he showed great talent, even having work accepted by the Royal Academy. But his father insisted he follow in his own footsteps and those of his grandfather and become a physician. He studied at Guys hospital and later became physician to the Mount Vernon Consumption Hospital in North London. There he pioneered the regime of sunshine and fresh air as the best therapy for TB patients and oversaw the redesign of the hospital to give his patients optimum exposure to these beneficial elements. When he finally had time for etching he showed astonishing skill and became renowned for his ability to draw directly from nature onto the copper plate as he sat in the open, reversing the scene as he sketched without ever using mirrors. His work was regularly exhibited at the Royal Academy and he became treasurer of the Royal Society of Painter Etchers to which he was later made an honorary member. Evershed spent his retirement in Sussex but travelled widely in Britain. 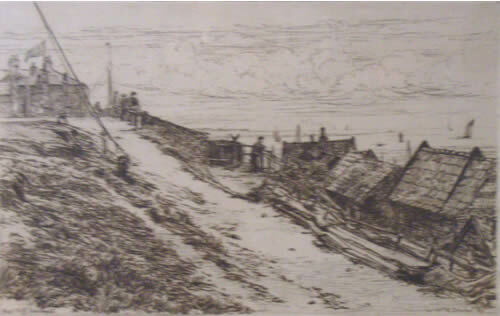 He published two portfolios of his etchings entitled 'An Etcher's Rambles'. The most highly prized of his work are the etchings he hand-printed himself which are distinguished by a boar's head stamp. Sadly, ours is not one of them! The museum has another Evershed etching, not currently on display, featuring an interior view of Critten's boat building workshop- a very similar view to the one painted by CH Cooke of the same workshop illustrated elsewhere on this page.